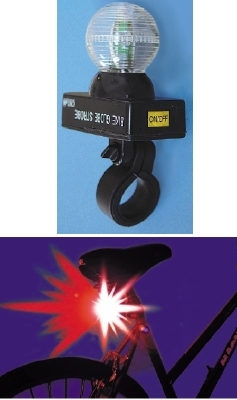 CMI, Inc. of Wheeling, IL has just introduced a bike safety strobe unlike anything in the market. It's called the "Bike Globe Strobe". It's spherical shape throws powerful LED light in virtually every direction. Dynamic pulses of intense RED light fire straight back while WHITE LED light fires to the sides for lateral safety. These super ultra bright LEDs are visible to 1/2 mile. The CMI Bike Globe Strobe includes 2 replaceable Alkaline batteries and a "no tools required" seat post adapter. It is so unique and effective, it's patented. This rugged all weather Strobe lists for $12.99, is covered by a 5 Year Warranty. It comes as a 6 pc. display and includes a free demo unit. The demo has a "try me" design and will last about one month on the included and replaceable batteries.